I generally tend to do things only once. I rarely re-read books, watch the same movie twice or visit the same place again unless I have to. 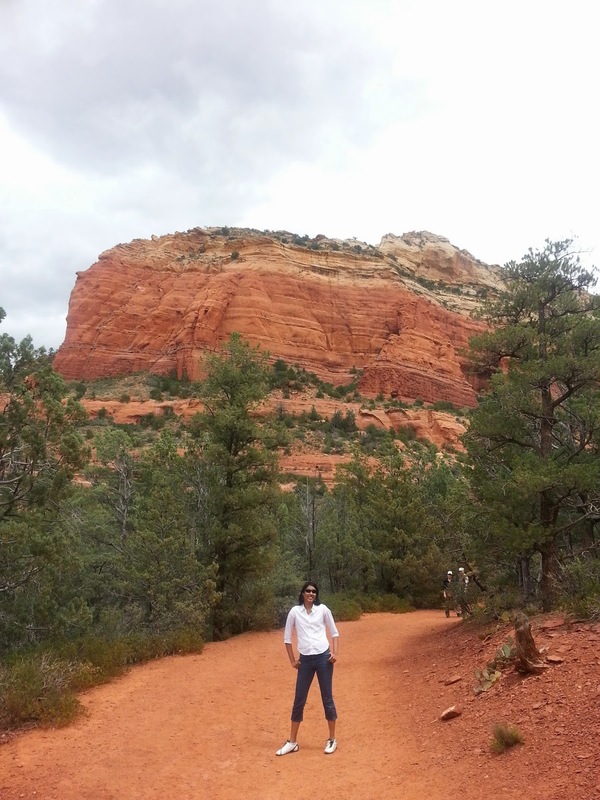 But Sedona is one place which I not only gladly revisited several times but also fell in love with each and every time. 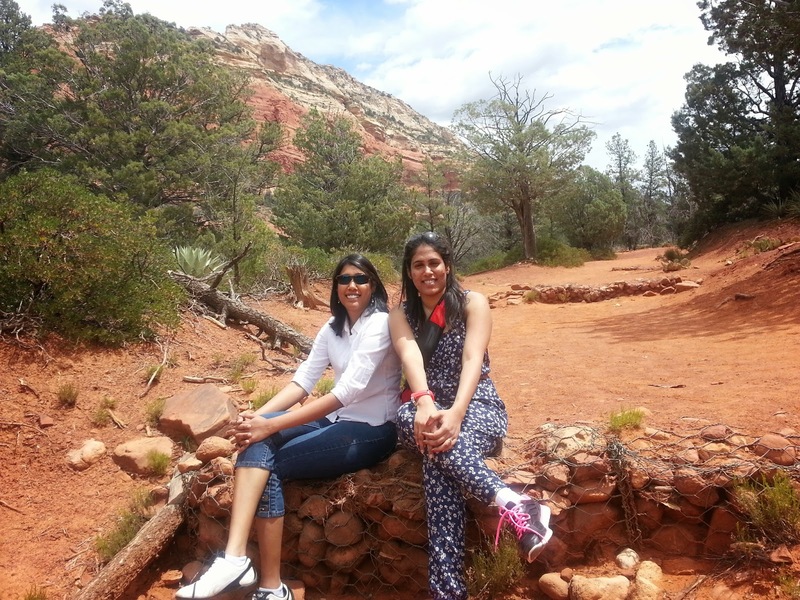 While its red rocks capture my imagination, its beautiful shops, wonderful hikes and lovely eateries add beauty and charm to the place. Last week, when my sister visited us from Boston and wanted to see around, it was easy to decide where we should go. 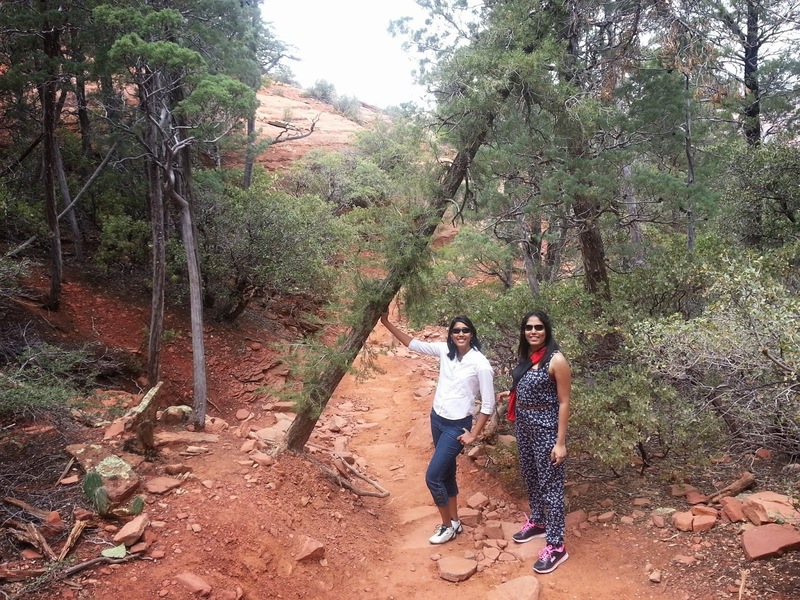 But what made this visit to Sedona special was the Devil's bridge hike, thanks to the recommendation of a friend. 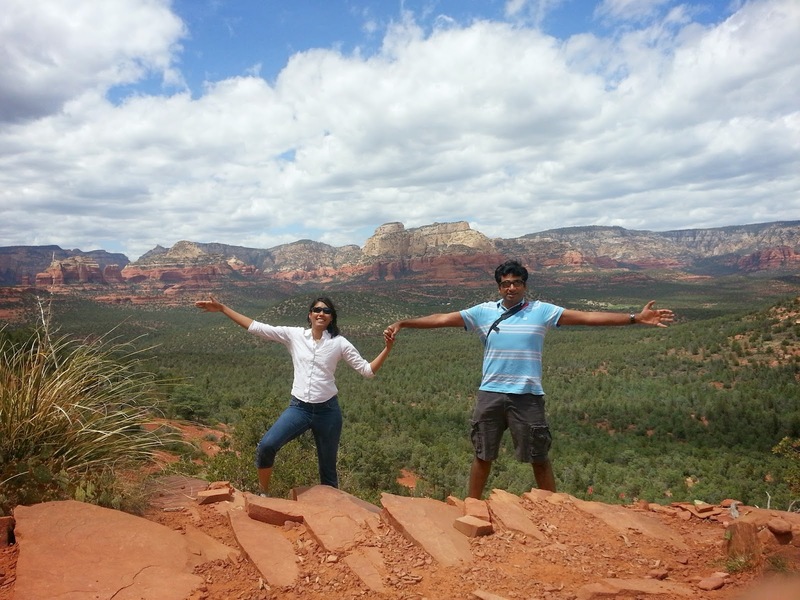 And now I tell everyone who is planning a day trip to Sedona to add the hike to their must-do list. 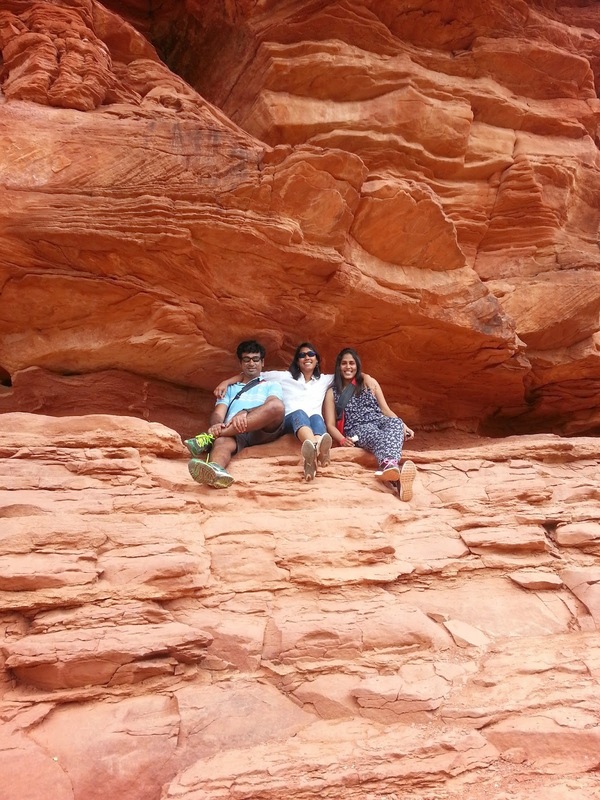 It is a 3.6-mile easy hike with very rewarding views. Except for a little climbing involved towards the end of the trail, the rest of it is pretty straightforward. Though the trail is popular, it can get a little confusing as there are 3 different routes for the same hike with varying distances - the shortest being 3.6 miles and the longest being more than 6 miles. Both the shortest and longest route have the same starting point while the medium route has a different starting point. We chose the shortest route while going and took the longest route back, hiking a total of 5 miles. For details on both, read on. Once you get onto the Dry Creek Road from 89A, drive for about 2 miles and then take a right at Vultee Arch road or FR-152C. 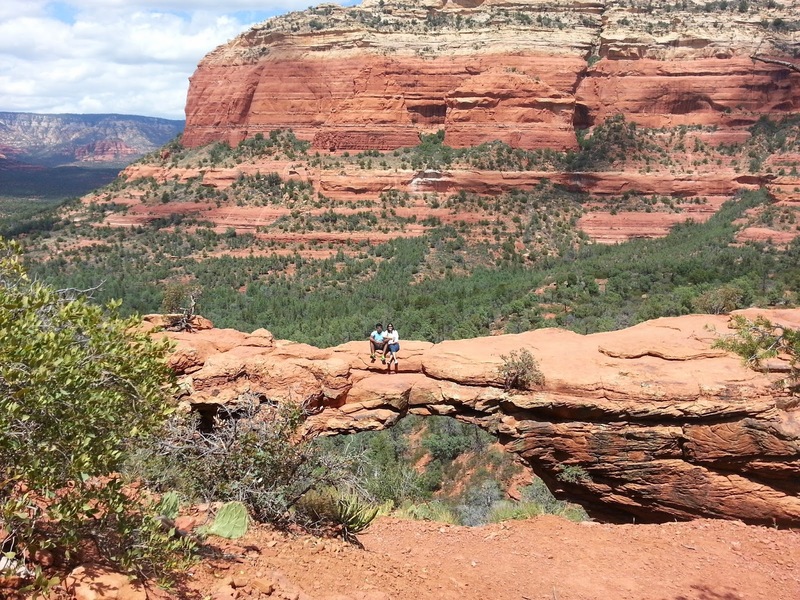 If you have a 4X4 high clearance vehicle, you can drive on this road for about 1.4 miles to reach the Devil's Bridge trail head. If not, drive a few hundred meters and you can park at the Dry Creek Vista Parking Lot on your left, which is what we did along with several others. 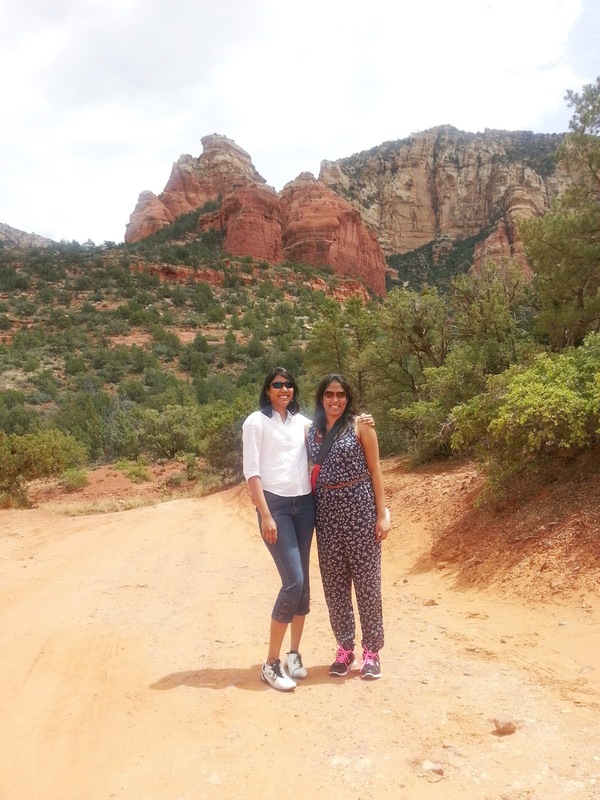 We then walked about a mile on the rocky dirt road to reach the Devil's Bridge trail head. We enjoyed the 1-mile walk on the dirt road but if you do not like the sound of an occasional Jeep passing you by, I would recommend taking the Chuckwagon trail which is longer but more peaceful. Once you park at the Dry Creek Vista Parking lot, you can find the ChuckWagon trail to the left side of the Parking lot while the FR 152 dirt road is to the right of the Parking lot (It is the continuation of the same road you took to reach the Parking lot). After about a mile, you would find the Devil's Bridge trail parking lot to your right and the trail begins. It is a 1.6 mile round-trip hike from this point. While coming back, we decided to take the ChuckWagon trail (the longest route) to our Parking lot instead of the dirt road. The trail is a nice walk through a forest and is mostly shaded. It added an extra mile to our hike but the views were not very different. If you have a time constraint, I would recommend taking the dirt road both ways and you would not miss too much. 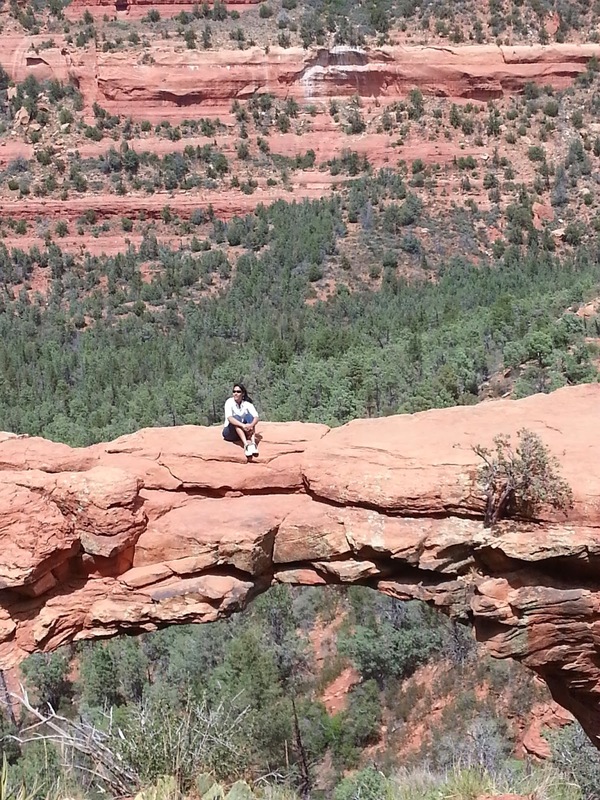 Like my friend who recommended this to me said, "Sitting on the Devil's Bridge, you would thank me for this." I did and trust me, you would too!